Built by local volunteers between 1928 and 1930, it was designed by an Oblate priest, Brother McIntyre, a trained engineer who surveyed the original grotto at Massabielle, and carefully measured ‘every rise, every indenture,’ erecting a scaffold to take the ‘photographic depth’ of ‘a fissure above the statue of the Virgin, impossible to gague by ordinary methods.’ (Lourdes Messenger, Vol.6 no.12, December 1936, p.413). In the construction of the Irish shrine, the plans were buried in the structure. Bernadette’s brother Pierre had presented a fragment of rock taken from ‘the very spot where Our Lady stood at Massabielle’ to an Oblate preacher, and that was also incorporated into the Dublin structure. The area around the Dublin grotto was designated ‘Rosary Square’ in imitation of the square in front of the basilicas in Lourdes where nightly torchlit processions conclude. An article in the Oblate’s publication Lourdes Messenger claimed that the main reason for the grotto was to enable those who could not afford to go to Lourdes to still share in its blessings: ‘a thought, first and above all, for the poor to whom a pilgrimage to the sacred shrine of Massa must ever remain but a fondly cherished dream.’ While Lourdes grottos had been built in Ireland, as well as elswhere, since the last quarter of the nineteenth century, these were generally fairly schematic in form, and what sets the Inchicore grotto apart is its verisimilitude. As well as the grotto being an ‘exact replica’, towers were built at the Irish Lourdes, where the Lourdes Chimes were placed, connected by an electrical device with the clock a facsimile of the Basilica spire clock in Lourdes and the entrance gates and railings exactly similar to those at Lourdes. As well as these physical replications, the actual devotions and ceremonial culture at Inchicore imitated those at the original Lourdes. The similarities between activities at the Irish and the French Lourdes were emphasised continually in the Lourdes Messenger. 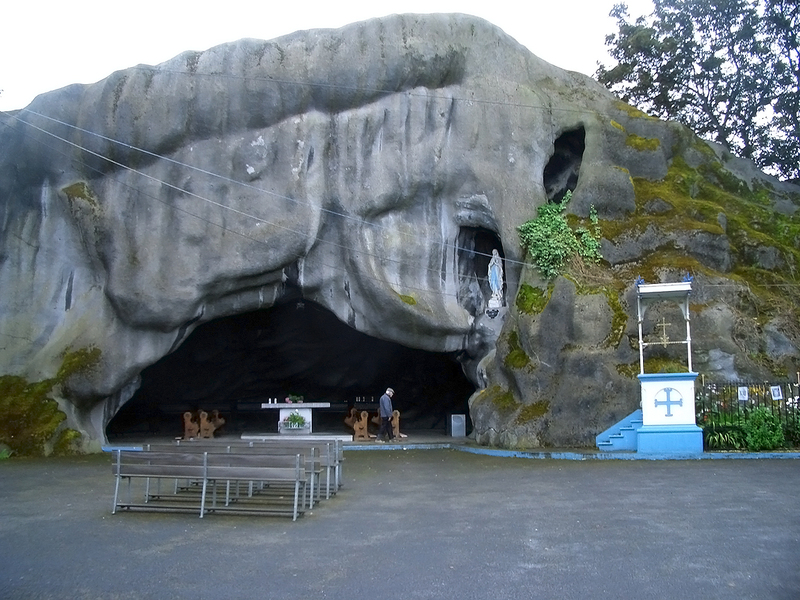 For example, following the opening of the grotto, devotions were held every evening, with ‘everything..carried out in as far as possible as at Lourdes itself’ including prayers, hymns and torchlight processions. The opening of the Inchicore Lourdes on 11 May 1930 was attended by an estimated 100,000 people. For this, the ‘whole western end of the city was decorated’ with arches of flowers and blue and white flags ‘waved everywhere’ to signal devotion to the Virgin, and the Papal colours of yellow and white shown in many windows. In the sermon preached to the congregation by the Bishop of Ossory, he emphasised that the Oblates had ‘brought Lourdes to Ireland’ and the shrine would ‘bring the people of Ireland to the feet of Our Lady, to restore the spirit of faith weakened by foreign influences.’ This comment – that the erection of a shrine precisely modelled on one in a foreign land – could help Irish Catholics escape ‘foreign influences’ is highly suggestive of the particular chronotope of the material and ceremonial culture of Irish Catholicism in the 1930s. In its strong and orthodox devotion to the Catholic world, it treated and spoke of that world as transcendent of national boundaries or even physical place, as suggested by the way that the ‘Irish Lourdes’ could stand for the real Lourdes. In the tradition of Catholic relics, the inclusion of a fragment from Massabielle denotes that authenticity could lie in actual materiality as well as simulacrum, but in general, the Irish Lourdes denotes the way Catholic space and time was infinitely reproducible under specific conditions. It is also suggestive of the role of mass production in other aspects of Catholic material culture in the modern era.